There aren’t a thousand words to say about The Busher; but for Charles Ray’s lead performance, I can spare a few hundred. Ray plays Ben Harding, a small-town baseball prodigy in a very charming, but flawed, little film. When the plot falters, as it does quite seriously in the second act, it is the deeply sad and very human Ben who keeps us engaged and propels the movie to its memorable end. The performance is well worth watching. 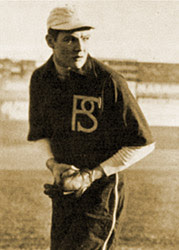 ‘Busher’ is slang, derived from another slang-term: ‘bush league.’ Young Ben Harding is a busher, all right, but a talented one—he throws a curveball so fast it could strike out a pro. However, Ben’s never tried to do that. He’s a simple guy from Brownville, USA. 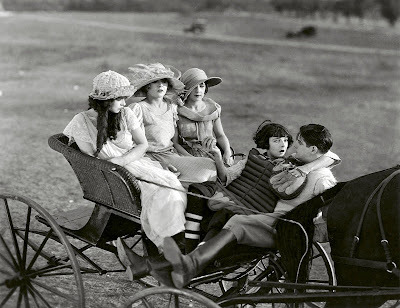 And he’s sweet on Mazie Palmer (Colleen Moore), the pretty girl who lives on a nearby farm. What would happen if this rube made it big? Would he lose his head and forget where he came from? Would some big-city floozy bewitch him? Would he abandon the simpler (but probably prettier) girl back home? The ascension, corruption and possible redemption of the innocent man is a dominant theme in American silent cinema, perhaps because it’s so adaptable. It can be a vehicle for light or dark comedy, romance, melodrama or even weighty morality plays, as mastered by a young D.W. Griffith and others. I’ll call The Busher a romance, though the means by which Ben secures a major league tryout seems more at home in a Harold Lloyd feature. It’s more serious than that because Ray makes it so. Just how has Ben’s deadly arm escaped the notice of the pros? He competes locally; he would have been so much better than his teammates that word would’ve spread. Maybe he was approached by a scout, but never followed through? I suspect this because, as Ray shows us, Ben lacks faith in himself. Not in his athleticism, mind you, but in his ability to meet others’ expectations. The result is a complex, conflicted character. As a social being, Ben is awkward, over-urgent and eager-to-please. But as a lover, which we also see, he is intense and focused. Ben and Mazie’s early scenes together have an eroticism belied by the pair’s head-to-toe country wardrobe. Watch Ben give Mazie a kiss on the cheek as a friend might do, but hold it long—and then follow it with a long kiss on the mouth. This is advanced foreplay, but until she brings him close, he remains a romantic klutz. Perhaps Ben has the same faults with respect to baseball that he does with romance? He’s good at it, and acts with confidence once given the opportunity, but it’s the getting-there that causes him trouble. Watch him fire curveballs past a batter he thinks is just another bush-league journeyman. Ben knows he’s good, and knows his dream of playing pro ball is a realistic one. Yet only here, against a man Ben believes is a scrub, can he feel at ease. Ben believes in himself just enough to hate himself for never taking the leap. This self-hatred only increases his need for approval and praise, but when he finally receives it—that is, when he’s unexpectedly signed to the majors, how does he respond? With a half-smile and bashful thank-yous toward the roomful of cheering friends. No one like Ben could enjoy such a pure moment of accomplishment; until the first batter is struck out (or possibly the last), he’ll doubt his powers. The Busher is quite light on intertitles. Ray’s performance, then, is generated almost entirely through posture, gesture and facial expressions (director Jerome Storm wisely gives the actor several close-ups). This was the best way to go, I think, because Ben is all about internalized conflict. By the time Ben heads to St. Louis, and to big city life, with its money and dames, we have long since accepted him as a credible person, rather than a type or caricature. It’s a good thing, too, because The Busher fails to show us how things go wrong. Ben’s combination of big talent and low self-esteem would make him terribly vulnerable to flattery, and wouldn’t it be interesting to see how this happens? But for some reason, we don’t. Ray is denied the extra half-hour of screen time he needs to show us Ben’s descent into cityfied corruption. Instead, we skip ahead to Ben’s return to Brownville as the conquering hero who’s lost his roots. His fortunes ebb and flow from there, as does Mazie’s love, and the movie never quite regains its form. So, we are left with two-thirds of a great film. The Busher, despite its structural failings, remains a casual piece of entertainment and, at 55 minutes, it makes a good ‘introductory’ silent for any first-timers joining you. But bubbling beneath the patchy script is Ben, with his anger and his fears. And through this remarkable performance, The Busher can make you a believer. I saw The Busher at a live public screening, put together by the Toronto International Film Festival (TIFF). 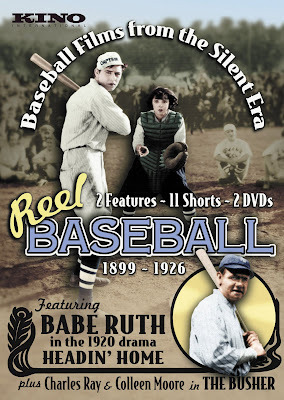 For home viewing, The Busher is available as part of Kino International’s Reel Baseball DVD, which also includes Headin’ Home (1920), starring Babe Ruth, and several other early, baseball-themed films made between 1899 and 1926, including an animated short starring Felix the Cat. I just watched this film and checked the internet to see what others have said. I pretty much agree with your comments. There must be missing elements of this film. There seems to be a big hole in the middle where we see him get his big head. 55 minutes is a bit short for a feature even in 1919. There has to be missing footage. The Busher definitely has a lot going for it. Colleen Moore is totally adorable, and there are a couple performances (Charles Ray in particular) that are more grounded and naturalistic than what I'm used to from the era. That middle section is truly unfortunate though. All you see from his professional career is one unsuccessful pitch with men on base and then the next minute the Pink Sox (haw) manager sends him packing. Was he ever good as a pro? Did the money and fast women chip away at his discipline? It would have been great to know! It's almost all worth it though for that moment when he's conscripted to pitch for Brownville near film's end... he holds the ball in glove near his face and seems to whisper something to it, like a prayer. It's intense... you can feel his thankfulness for the second opportunity. I didn't quite get the ending. They're skipping through a field and looking at a newspaper? Did he pass on that latest big league offer to stay with the girl? I don't know why he couldn't have both. Marry her and play ball. Watch The Coward--also reviewed on this blog--to see Ray at his best. To me, The Busher feels like a film with a few reels missing.